Interested in the study of biological oceanography? Consider pursuing a career as a Marine Biologist. All marine life forms are studied by marine biologists, from microscopic organisms, to plant life, to large life forms – such as whales. Marine biology includes the associated disciplines of physical, geological and chemical oceanography. Fundamentally, biologists seek to understand the physical characteristics of animals, their behaviors, interactions between animals, and the impact of animals on their environments. Biology also includes the impact of humans on animal environments. Marine biologists focus on wildlife found in the oceans and other saltwater environments (for example, estuaries and wetlands). A romantic view of a marine biologist is of a professional working with dolphins or whales, conducting exciting experiments in intelligence and interaction. Realistically, though, very few marine biologists are able to spend their careers exclusively studying whales or training dolphins. Because job options are so wide-ranging, becoming a marine biologist can take as little as obtaining a biology degree or as much as securing a doctorate (PhD). The best way to discover a passion for marine biology is to spend as much time as possible engaging in related activities. This includes volunteering for biology-related projects such as animal counts or environmental clean ups. It is also wise to look for work experience in anything biology-related including aquariums, animal sanctuaries and zoos. Marine biologists study a range of sciences and must be able to do so at a college level. Use time in high school to establish basic student aptitude for sciences. Students should study biology, chemistry, physics, geology and ecology, ideally earning a biology or marine biology degree. At this stage, specialization in marine sciences is feasible, though not absolutely necessary. Seek internships and research opportunities. These can help a candidate determine areas of specialization and get employment after college. Choose a school with a good biology program. Universities that offer opportunities for specialization in marine biology are valuable. Consider a school that combines a bachelor’s-master’s program in order to gain an advanced degree in less time (see below). Candidates will need a bachelor’s degree in biology. This career stage can be a good time to gain specialized experience such as focusing on a species, region or even job function. Possible employers at this level include government agencies, labs, research organizations and labs. Obtain Advanced Degrees (Master’s And Doctorate), According To Career Goals. Advanced degrees can boost career options as well as earning power. A master’s degree is often necessary for teaching and for some consulting and research jobs. A marine biology PhD is often required for high-level jobs such as college-level instruction, program team leadership or independent research director. 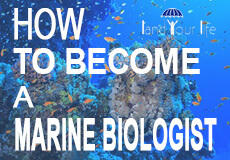 Marine biologists have a many possible careers and can work in an exciting range of environments. For example, marine biologists work in field research, teaching, hydrology, science writing and universities. Work environments can include everything from research vessels to aquariums and zoos to laboratories, classrooms and offices. An individual with the title “marine biologist” might be managing a wildlife preserve, compiling data and computer models, or lecturing a classroom full of university students. What Does an Average Day For A Marine Biologist Look Like? A day in the life of a marine biologist will vary entirely upon their job. For example, a science writer’s day will look very different from that of a field researcher or manager of a wildlife preserve. Conceive of and map out a concept for a study of marine animals. List goals and parameters of study including what is to be studied, how long, how it will be studied, whether the animals will be in natural or controlled surroundings, how much the study will cost, and other specifics. How the data are collected will be determined by study parameters. For marine biologists, sample collection may be underwater, collected over extended time periods. To manage the data, samples must be organized carefully according to study parameters. Marine biologists could be marking samples to show when they were collected, how they were acquired, what they are, and any other salient information. Biologists log the data they collect into computer systems and then engage in analyzing it. This can mean examining it to ensure it is complete, cleaning and correcting it, and modeling it with the goal of discovering useful information or suggesting conclusions. Marine biologists are typically comfortable with desktop data analysis tools. A researcher marine biologist will probably conduct a quantity of lab experiments. The goal will be to discover a fact or demonstrate a general truth. The biologist will alter factors under controlled conditions to study the results. Experiments will be carefully documented and, if a fact is proven, repeated. Experiments can be ongoing, without immediate, obvious results. Marine biologists might be conducting many experiments at once. Scientists must communicate their findings effectively in order to demonstrate results. Data driven research papers are vital to communicating findings and securing future funding for projects. Scientists are often expected to present their conclusions or the results of their experiments. Effective presentations will include illustrations, salient facts and conclusions. Presentations can be to review boards, students and community groups. Are You Suited for A Career As A Marine Biologist? An entry-level job as a marine biologist usually requires a bachelor’s degree in biology at a minimum. Marine biologists must be able to succeed in college-level science course work. Biologists must be able to observe and note even small changes in animal behavior, characteristics or appearances. The must be able to document details at an exacting level. Marine biologists perform much of their research work outside, in close proximity to bodies of water. Marine biologists should be comfortable on and in water, know basic safety protocols, and be able to handle research equipment and tools. Work environments may require periods of relative isolation, irregular schedules, and long hours. Biologists must be good communicators. Their work may require them to write scientific papers, speak to policy makers, the public and to students. Additionally, they may need to explain scientific data in terms non-scientists can understand. Biologists must be able to understand raw data, create models and research protocols, and draw conclusions. Marine biologists can make a good living, but are not paid higher than other highly educated professionals. Field researchers especially may work long hours, spending significant quantities of time away from home, and even without human contact. The title “marine biologist” can apply to so many jobs, there is no specific certification required to use it. However, to obtain most entry-level jobs, a bachelor’s degree in biology is generally considered the minimum degree necessary. To advance in the profession, and secure higher level positions, a master’s or doctorate are needed. It should be noted that an advance degree in biology is not a sure investment in job security. How Does A Marine Biologist Find Work? The Bureau of Labor Statistics (BLS) notes that state and federal governments are the top employers of zoologists and wildlife biologists, employing more than half of the professionals in the U.S.
Another 10% are employed in research and development. 7% are employed in management and consulting followed by education (6%). Though there is no formal credential requirement for workers with the title “marine biologist.” A bachelor’s in biology is considered the minimum requirement for most jobs. A masters or PhD is required for higher level positions. Finding internships and volunteer opportunities in areas of professional interest is an effective, efficient way to network within a specialty and position oneself for paid work. Engaging in research and writing can help the prospective marine biologist create and extend a professional profile. What is the Average Salary of a Marine Biologist? According to the Bureau of Labor Statistics (BLS), the median annual wage for zoologists and wildlife biologists was $62,290 in 2017. Job growth estimates for wildlife biologists are average. The BLS expects the profession to grow 8% from 2016-2026, which is average for all occupations. While there is increasing need for biologists to help study and manage human impact on the environment, employment outlook is modest due to government-employer budgets. Though job growth estimates are not high for wildlife biologists, good job opportunities do exist. Some job openings will come from natural attrition (retirement, career change, advancement). Other openings will come from specially funded projects and conservation initiatives. Advancement in the profession will come from a combination of educational accomplishment and field experience. Experience needed for any job will vary greatly by organization. American Elasmobranch Society supports the scientific study of sharks, skates and rays. American Fisheries Society (AFS) is the oldest society for fisheries scientists in the U.S.
American Institute of Biological Sciences (AIBS) supports researchers, educators and scientists in sharing biological discovery and knowledge. American Society of Limnology and Oceanography (ASLO) ASLO builds community and communicates knowledge across the full spectrum of aquatic science. American Society of Mammalogists includes marine mammals in its focus. The site offers papers, community features and a job board. Archie Carr Center for Sea Turtle Research’s mission is to conduct research in all aspects of the biology of sea turtles, and to further marine conservation through the communication of these research results. Chelonian Research Foundation supports worldwide turtle and tortoise research. Ecological Society of America promotes ecological science by improving communication between ecologists and increasing resources available for the conduct of ecological science. The Estuarine Research Federation is a private, non-profit organization dedicated to the wise stewardship of estuarine and costal ecosystems worldwide. Gulf of Maine Research Institute is a nonprofit organization that works on issues of ocean stewardship and economic growth in the Gulf of Maine region. International Society for Reef Studies disseminates scientific knowledge and understanding of coral reefs, both living and fossil. It publishes the journal Coral Reefs. Marine Biological Association of the United Kingdom advances marine science through research, communication and education. Established in 1884. Marine Biological Laboratory is dedicated to scientific discovery and education in biology, biomedicine, and environmental science. Founded in Woods Hole, Massachusetts, in 1888, the MBL is a private, nonprofit institution and an affiliate of the University of Chicago. Marine Conservation Biology Institute works to secure permanent protection for the oceans’ most important places. Marine Mammal Observer Association (MMOA) focuses on the collection and use of data. National Association of Marine Laboratories (NAML) stimulates research and promotes education in the marine sciences. North Atlantic Marine Mammal Commission (NAMMCO) focuses on conservation, management and study of marine mammals in the North Atlantic. Phycological Society of America publishes the Journal of Phycology and the Phycological Newsletter. Focus is on algal research. Seagrass Recovery The mission at Seagrass Recovery is to save oceans, estuaries and shorelines for generations to come using scientifically proven technologies. The Society for Marine Mammalogy promotes marine mammal science. Whale and Dolphin Conservation Society is dedicated to the conservation and protection of whales and dolphins. They work towards a world where every dolphin and whale is safe and free. Woods Hole Oceanographic Institution is dedicated to research and education to advance understanding of the ocean and its interaction with the Earth system. As of right now I am an actor in the Chicagoland area and I love it, I absolutely love it. However, I have always been interested in sharks whales dolphins, well to be honest the ocean in itself. What is the first step and what is a smart school, maybe a list of five, to start a degree in Marine Biology specializing in sharks and dolphins – even though one’s a mammal on one’s a fish.